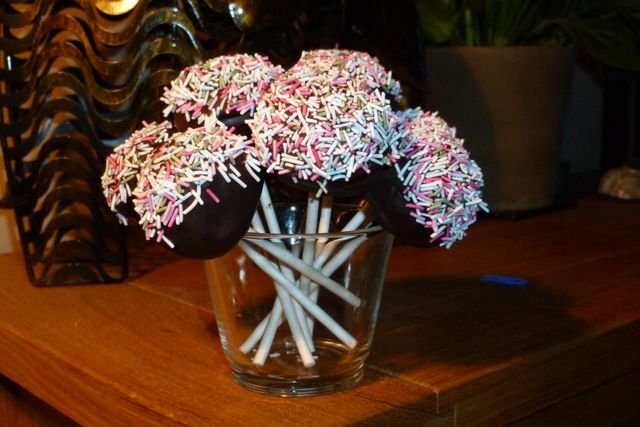 Bonitocrafts | Crafty stuff that I want to show off. Crafty stuff that I want to show off. …in fact even longer than I thought it had been. Gosh doesn’t time fly? To be honest the last couple of years have been something of a roller coaster. I won’t go into details as that is not fair for all involved, but the upshot is that I have embarked on a whole new life on my own this year. It’s been scary, emotional, extremely hard but also quite exciting at times too. But. Onwards and upwards. A fresh new start and all that. Now I am settled in my new home, I am looking at my creative interests and finding time to indulge in them a little more. So much to do and so little time. 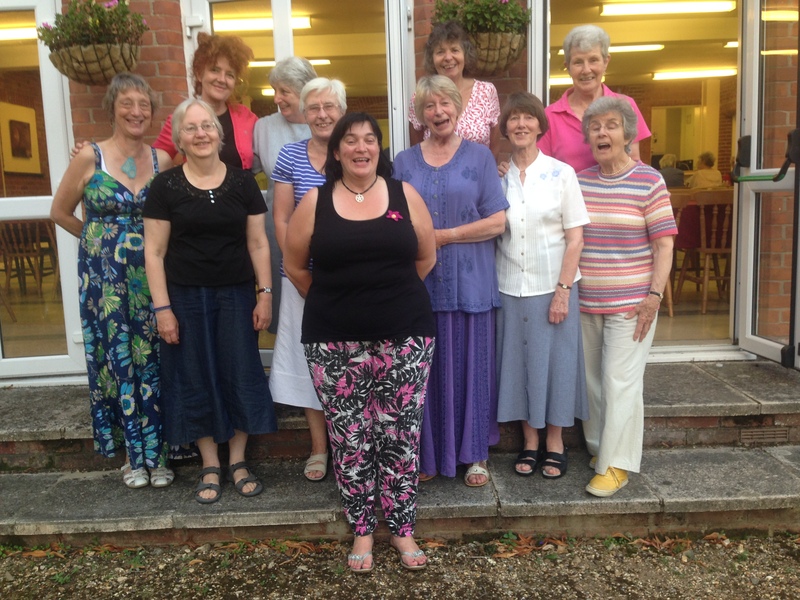 Last week I had the honour of teaching at The Lace Guild’s Summer School. I had a mixed class of ten students all working on something different in either Milanese, Idrija, Bedfordshire, Torchon or Bucks Point laces. It was hard work and challenging at times but hugely rewarding to teach such a lovely and enthusiastic group of learners. I thoroughly enjoyed it after the initial fear at the start of the week. I am looking forward to getting on and making some more bits and pieces to share with you here. Hopefully my next post won’t be another two years away. 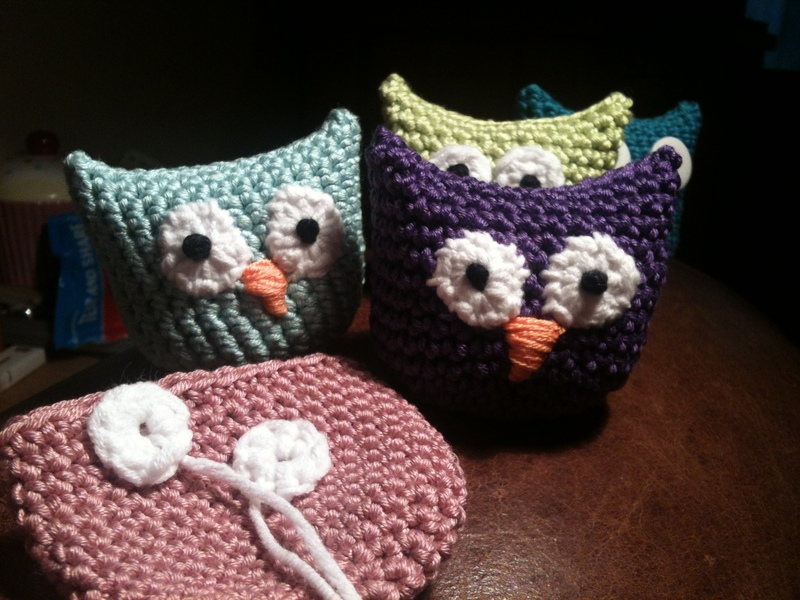 Whilst in my crochet phase I made a few other bits and pieces. As my previous post was getting a little on the long side I thought I’d give them their own post. I love Japanese Kokeshi dolls and Russian Matryoshka dolls and looked around to see what patterns I could find. 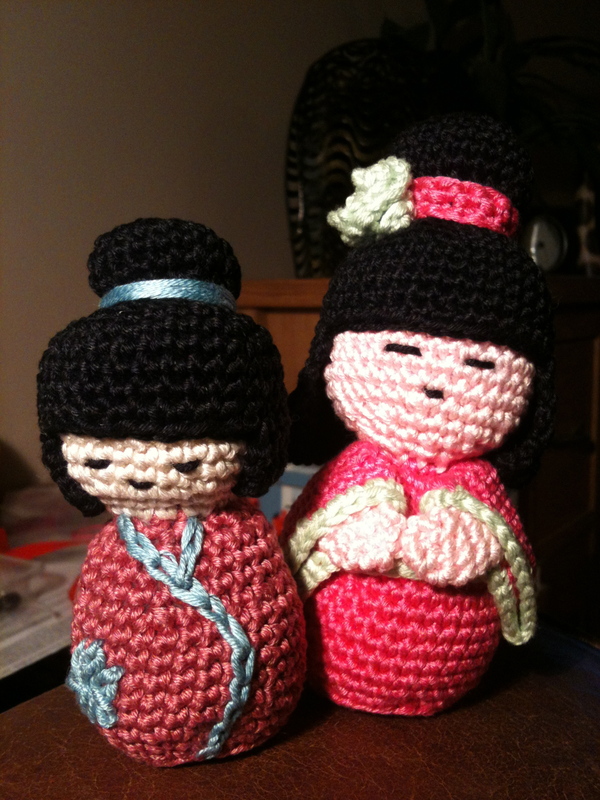 I wanted a Kokeshi that I could work up fairly quickly like the little owlies I had made previously. I found two patterns online and made them up. 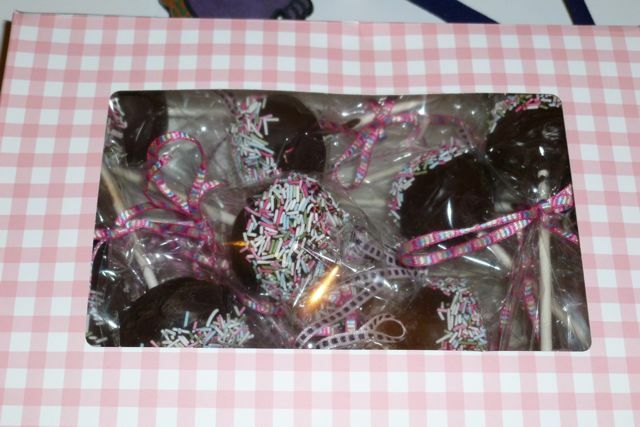 One was slightly larger than I wanted and although I was really pleased with her, she took a bit too long if I were to end up making them in any quantity. Additionally, the sleeves were very fiddly to work. Next I tried a smaller one. 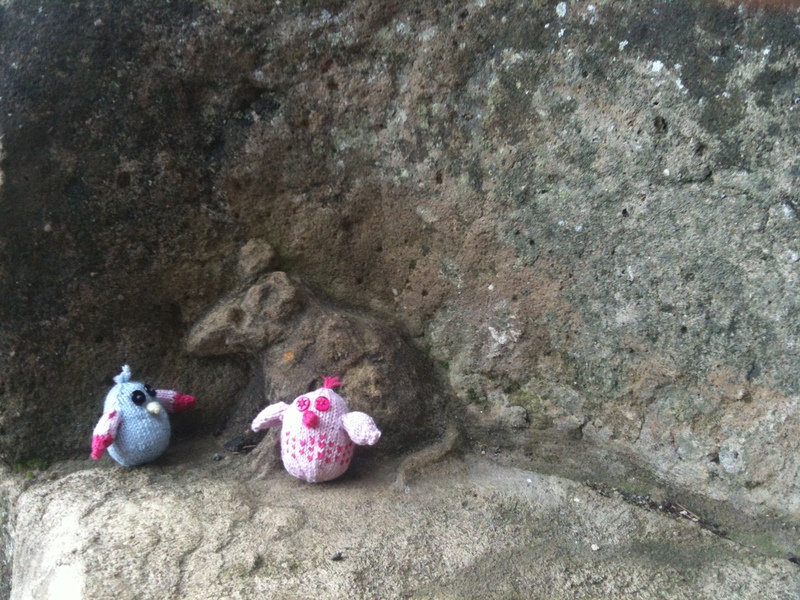 This one, although very cute was way too small and fiddly to work and was most reluctant when it came to standing up on her own. The solution? Well, I designed my own. She’s simple and relatively quick to work, perfectly sized and stands up well. I have written out the pattern and a friend has tested it. 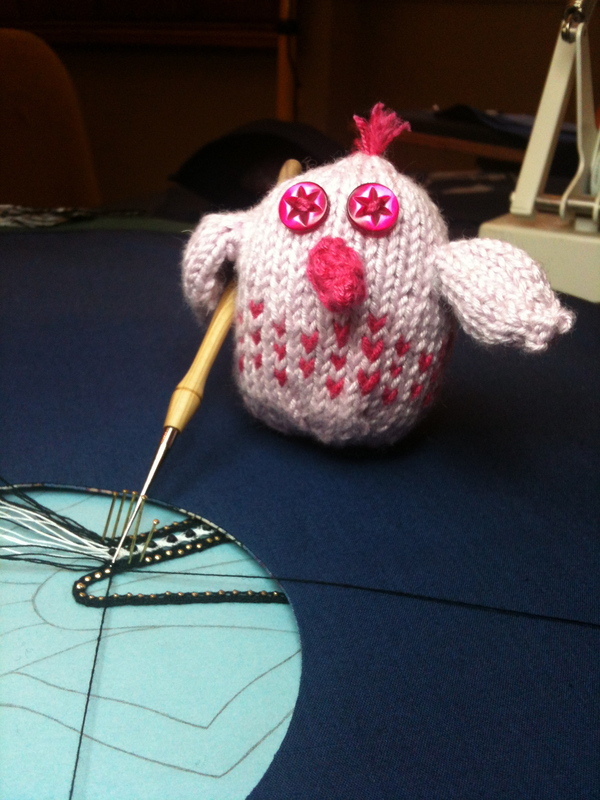 I’d quite like to sell it through etsy, folksy or ravelry but I need to come up with a few more designs first. 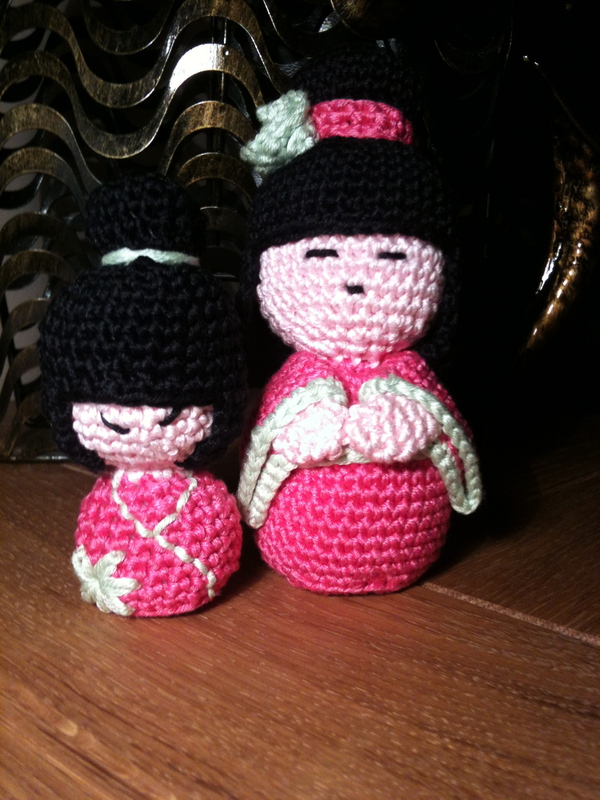 Kokeshi Dolls. Own design on left. 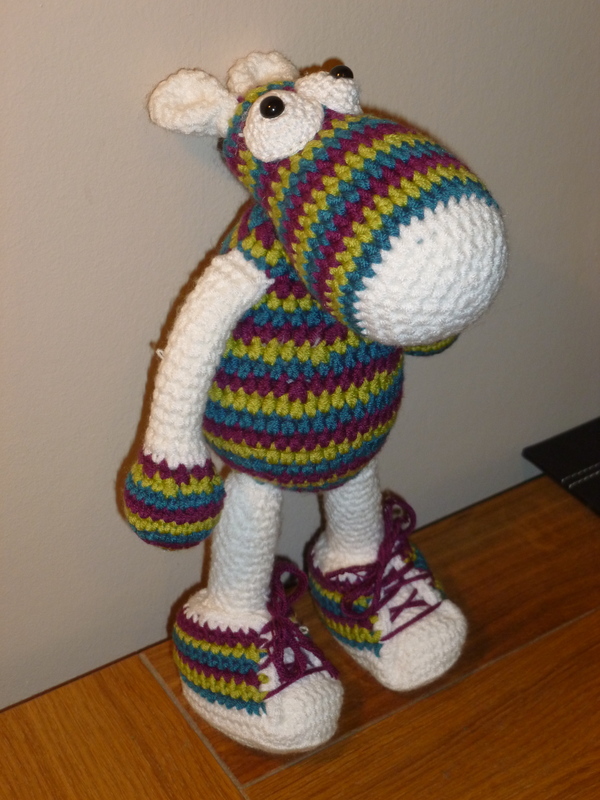 I completed a couple of other yarny projects last year. 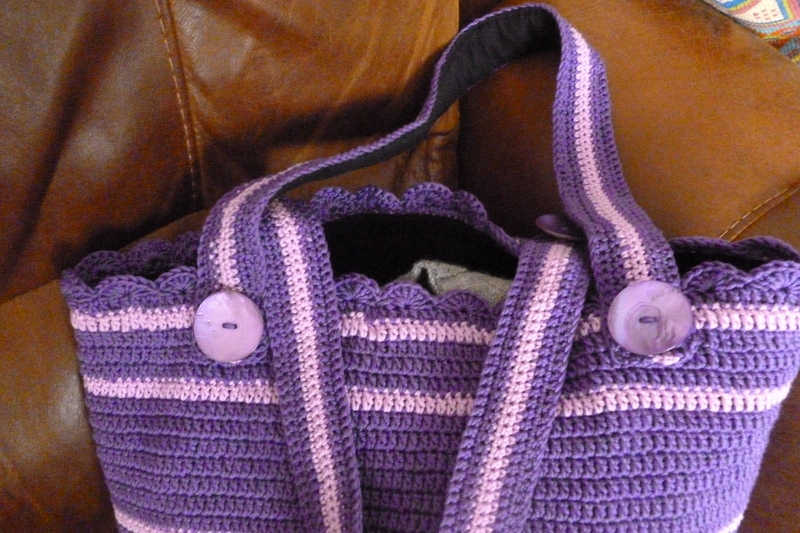 The first was a crochet bag based on the ‘Lucy” bag from Attic24. This was a birthday present for my Mum, she was thrilled with it and uses it all the time. 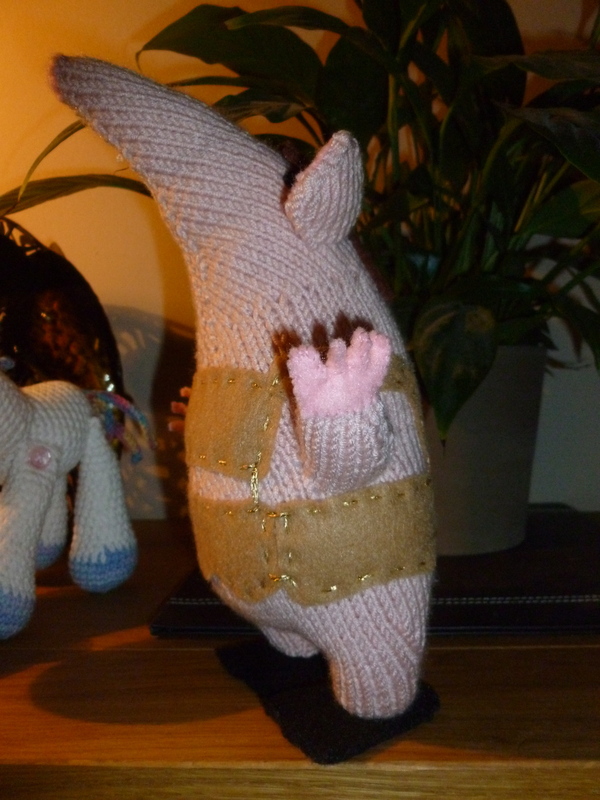 I also stumbled across a pattern for a knitted Clanger (one of my favourite TV programmes as a child). He is knitted, and my shoulders soon reminded me why I don’t knit any more. I don’t think I’ll be making any more of these. Here he is anyway. That’s pretty much all for my knitting and crochet apart from the project I am currently working on. I have wanted to make another blanket for a while now. 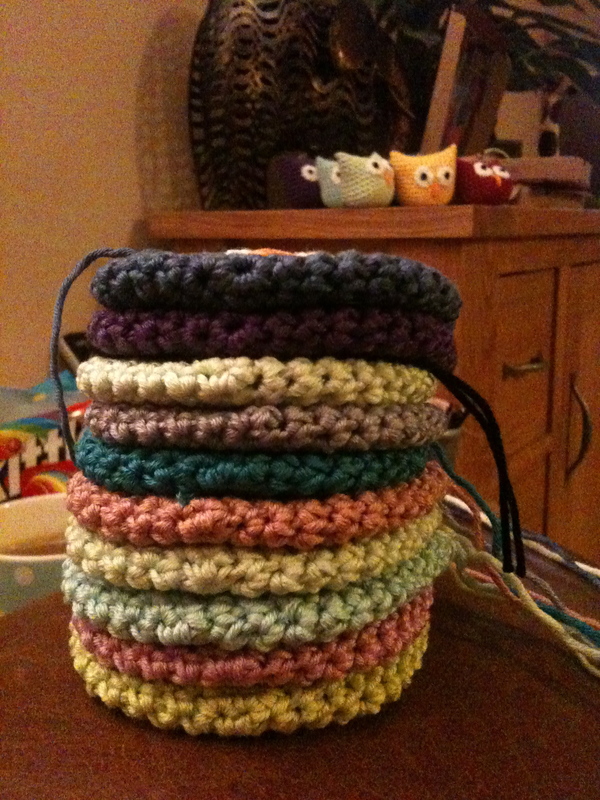 I have a load of Acrylic Double Knit hanging about so have made a start on one. It is a variation on the ripple blanket that I finished back in November 2010 however this time I am putting a single row of white between each colour to give a different look. I have 10 colours plus white and plan to do 4 repeats of the colours to make a square blanket with an added border around the edge to finish it off. The plan is for a picnic blanket, although whether it will be used as such is another matter. It will make a lovely bright snuggle blanket for the sofa if nothing else. 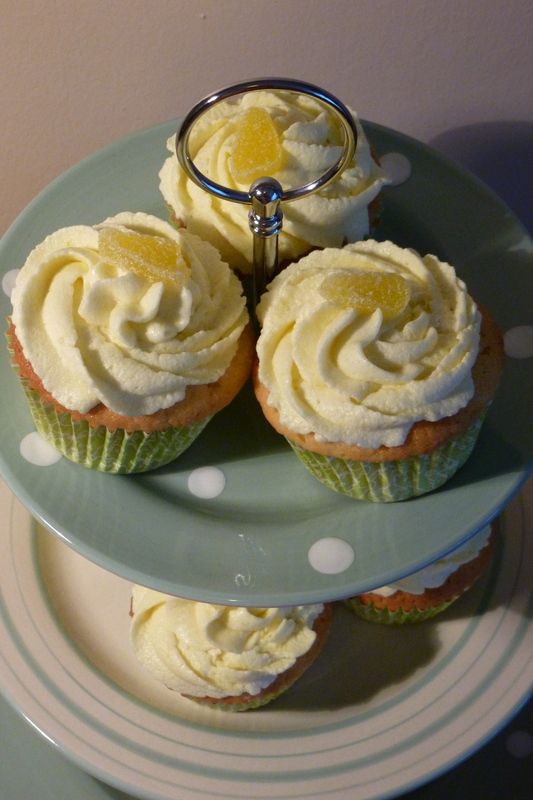 I am finally nearly there with my catch up posts. One or two more and I will be sharing much more current projects with you soon. Thank you for reading. It all began quite innocently enough. 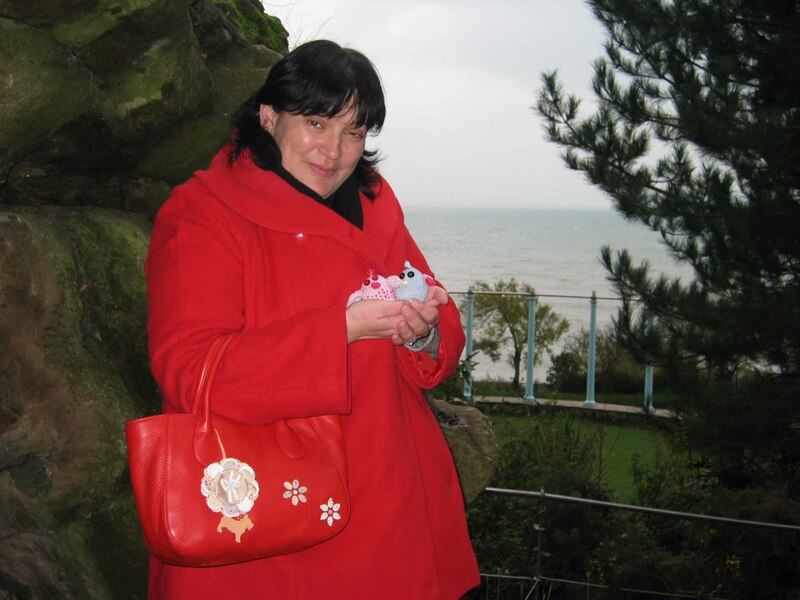 I was away on a lacemaking weekend with my friend L in Folkestone last November. Another dear friend J came down to visit me on the Saturday afternoon. Now, the lovely J is a wonderful lady. 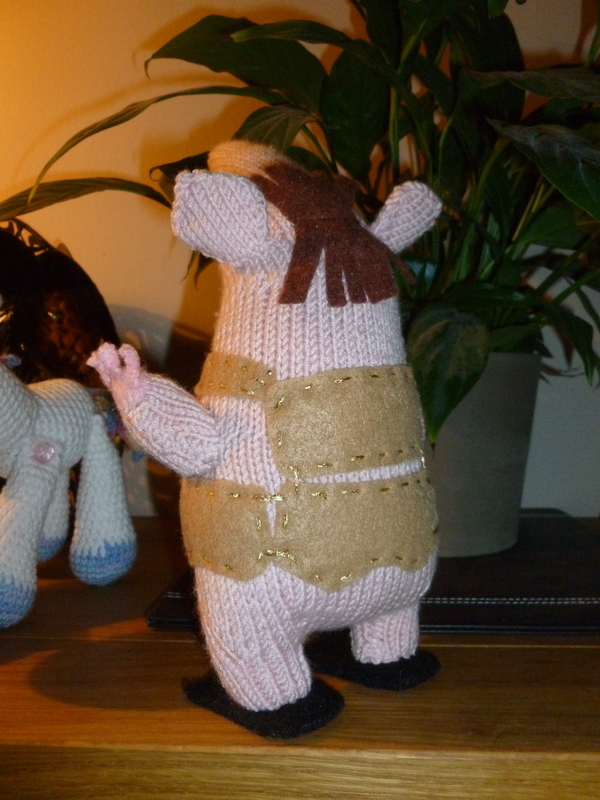 Incredibly talented and creative and an accomplished knitter. 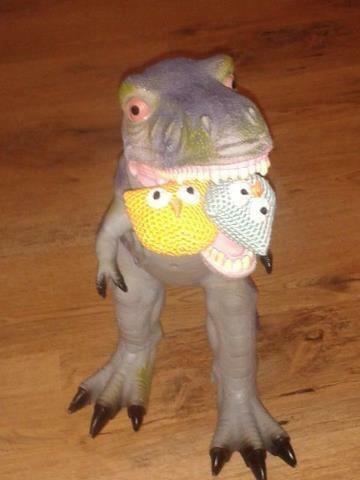 Every time that I see her she has her latest creation squirrelled away in her handbag. Usually together with a box of cakes, cookies or fruit too when we have one of our regular meets for a cuppa in her local coffee shop. It’s a little like a visit to see Father Christmas waiting to see what she has hidden in her bag this time. This weekend was perfectly timed for me as I was just poking my head back out into the world after a bit of a dark time. j arrived just as we were finishing lunch and as it was a nice day we decided to take a walk down the zig zag path that is near to the hotel and along the little coastal country park. 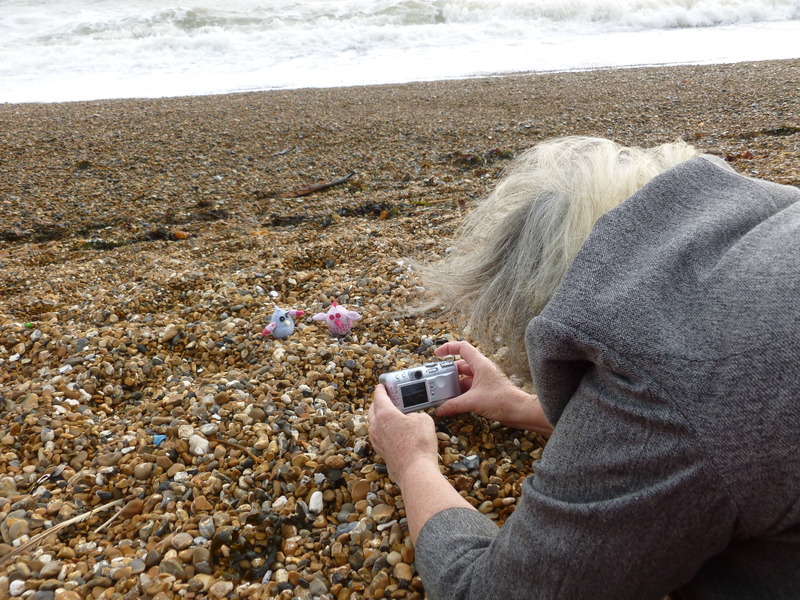 As we headed off J introduced me to her two little birdy friends that she had brought along for the trip. 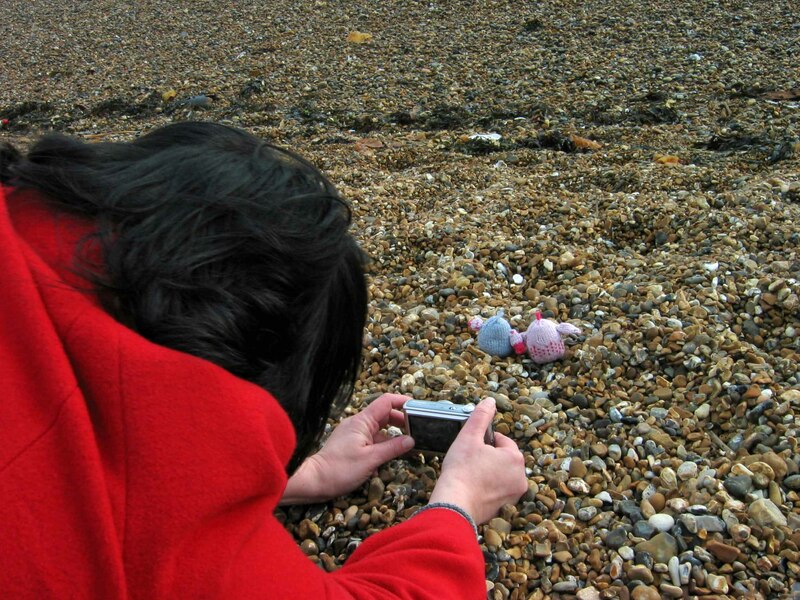 Now, one of the other things my creative friend does is to take her animal creations and photograph them in different situations. These sometimes find their way into little story picture books that go with the creatures, often to her great nieces and nephews. 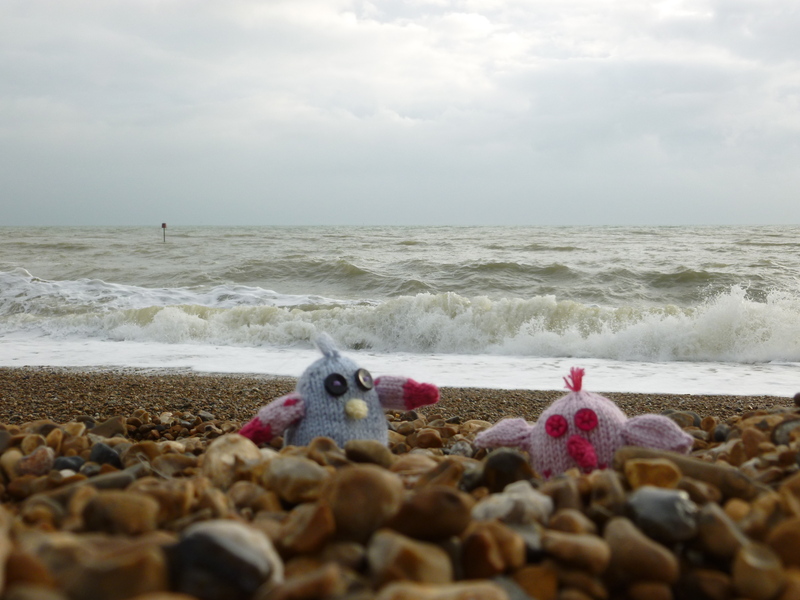 We had a lot of laughs that afternoon along with more than one or two funny looks from passers by as photographed this little pair of birdies on their trip to the seaside. All too soon it was time for J to head for her train home but before she left she said that she felt one of the birdies should stay with me. 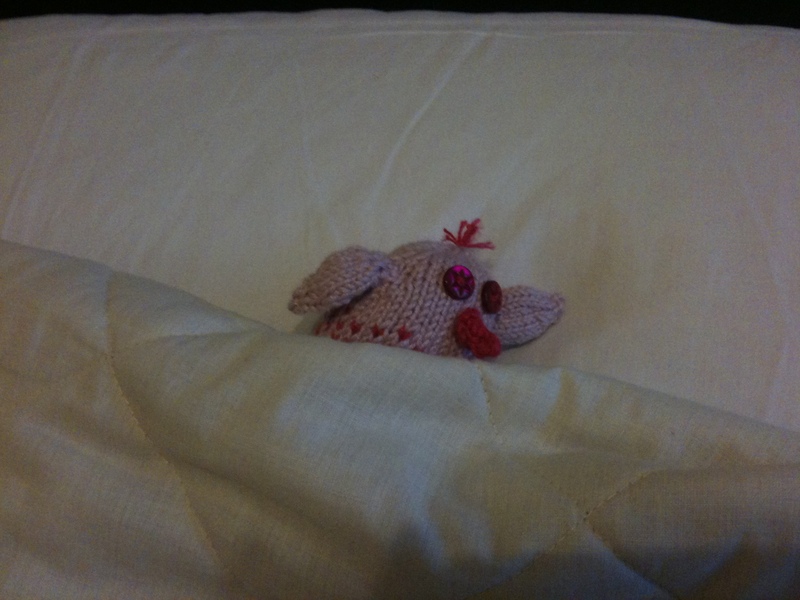 It was a tough choice to make but in the end little Pinky stayed with me, she helped me with my lace before a well earned sleep in my room. 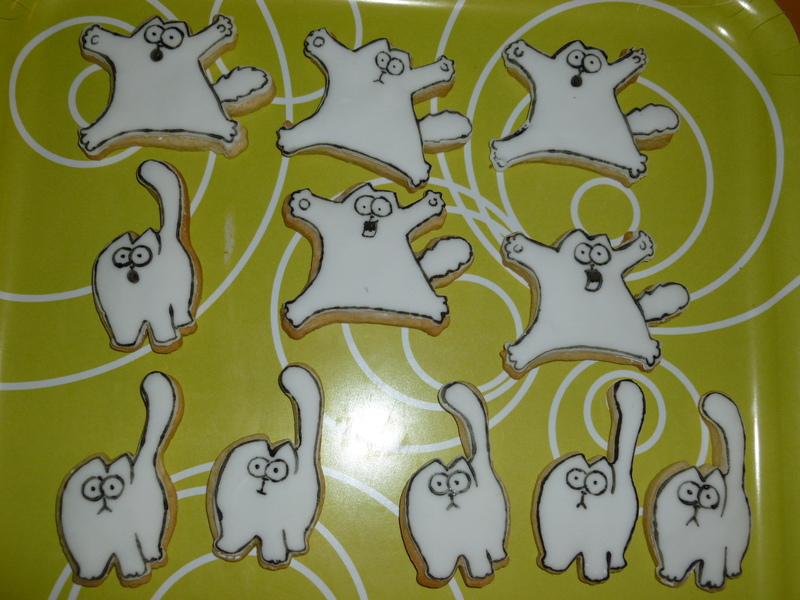 Here are some pictures of these little cuties. So. What has this long winded tale got to do with Owls and Unicorns? Well. The little birdies got me thinking. 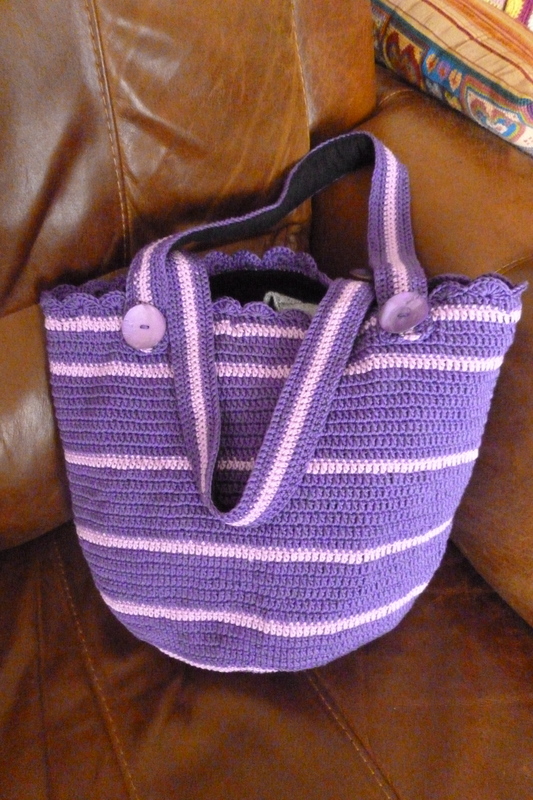 Having some yarn still left over from my ripply blanket and stripy bag, I had been looking out for projects I could do to use up the left over scraps with. 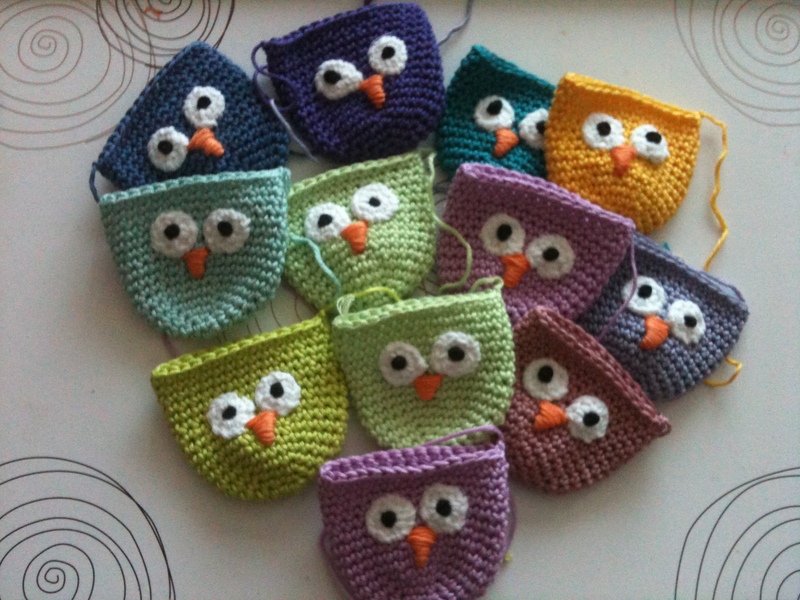 I liked the little birdy idea and being a bit of an owl fan it seemed a natural progression. 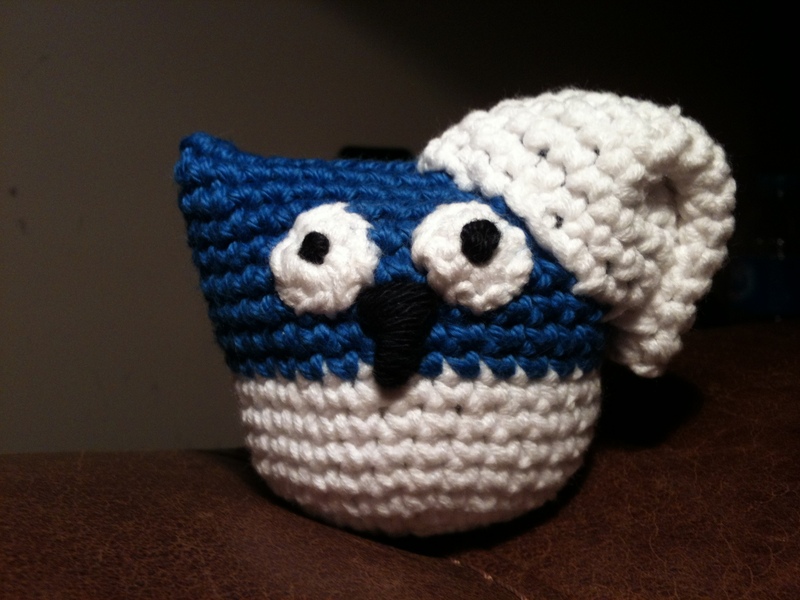 I also wanted to try my hand at amigurumi – a crochet technique where you work in rounds – A little search on Ravelry and I came across this simple little pattern. 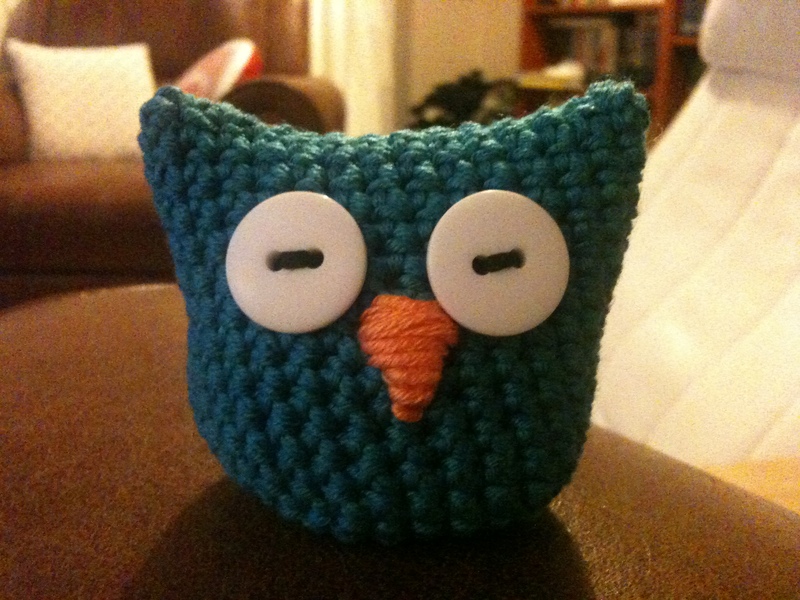 A few tweaks and I made this little owly my own. 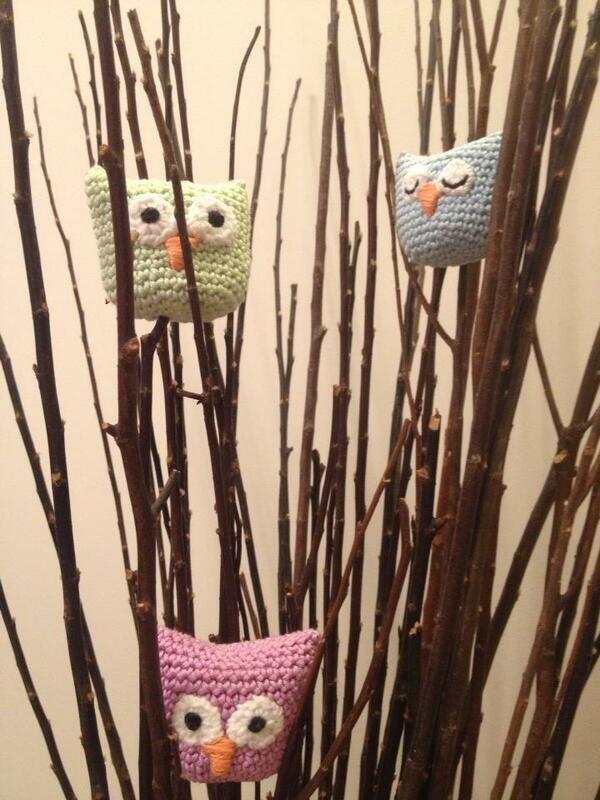 As more people saw these little owlies I was inundated with requests to make them for people. 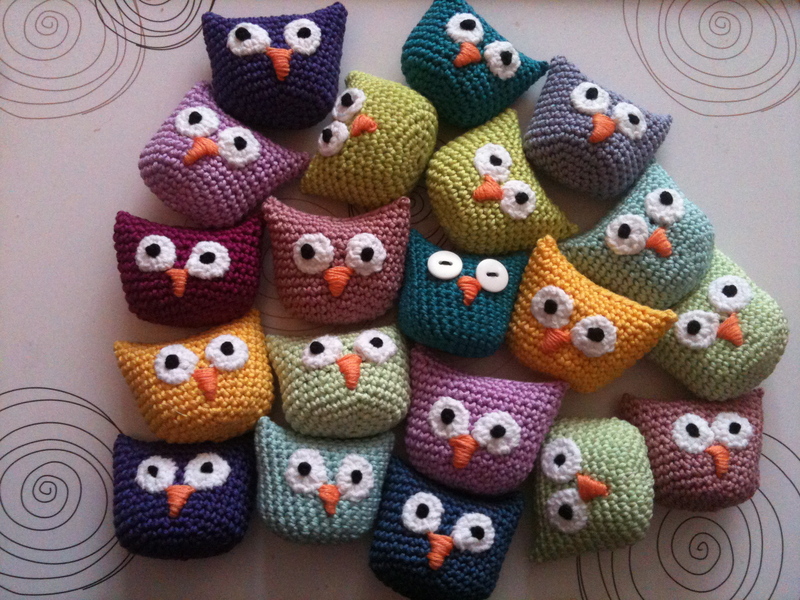 I have produced over 60 little owlies now although I have now lost count a little. 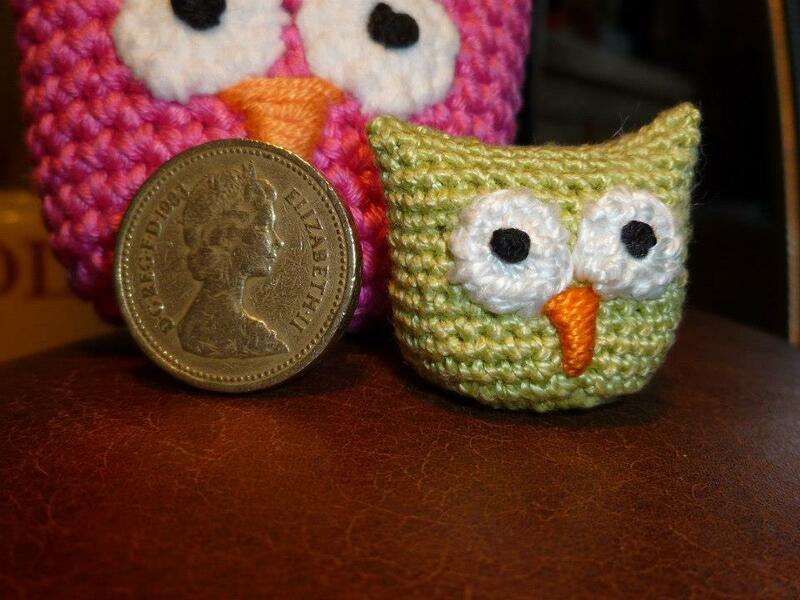 I also made a couple of larger ones, a couple of smaller ones and a super tiny one which is strictly a one off. 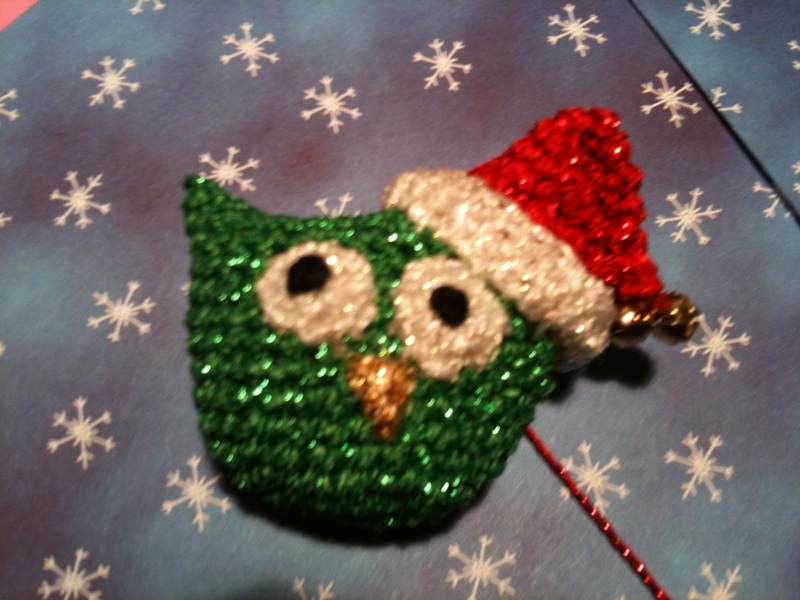 Not to mention a sparkly Christmas owly and a smurf owl as part of a running joke with a friend of mine. 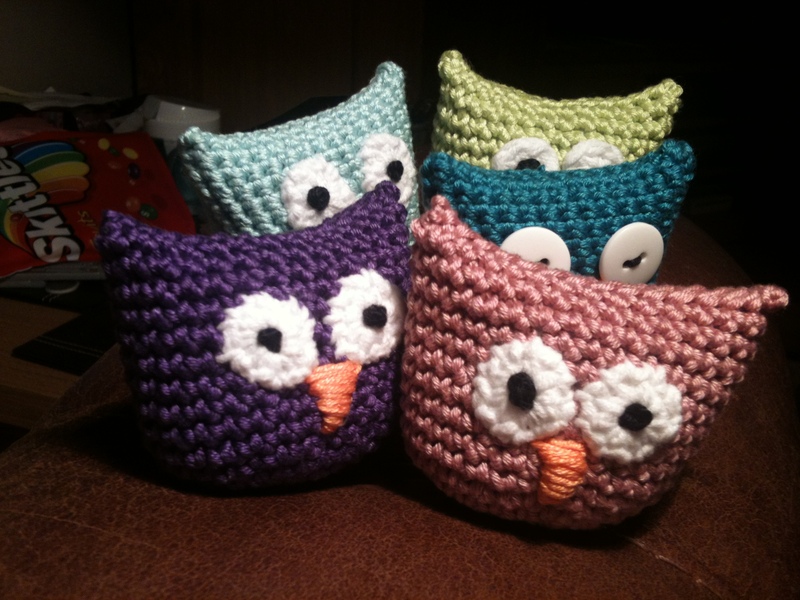 Here are some pictures of just some of the owlies that I have made to date. 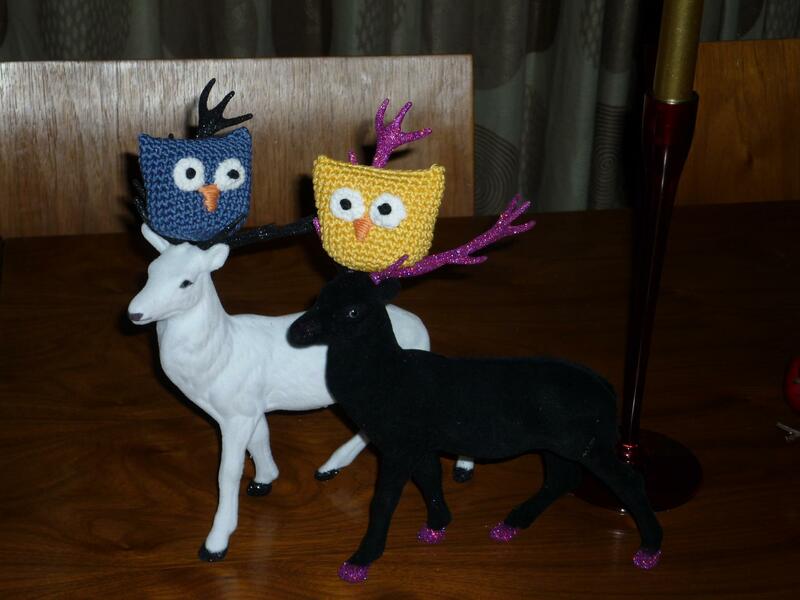 Some of my owlies sent pictures of themselves in their new homes. Here are a few of the pictures I received. This stash busting project did backfire somewhat as I ended up needing to buy more colourful yarn supplies to make up all the requests I received. 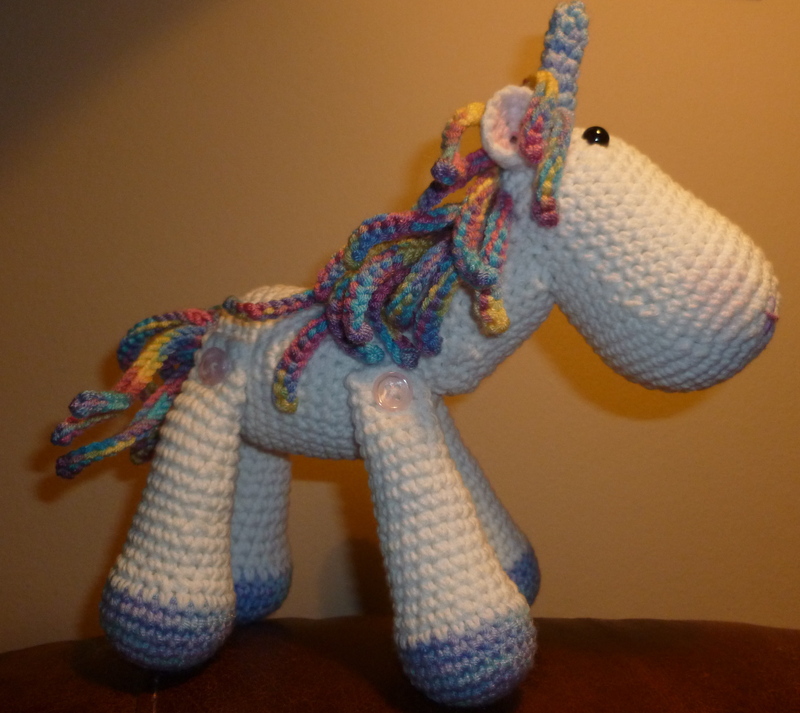 Whilst looking around for more amigurumi projects to try I came across this very sweet little unicorn. 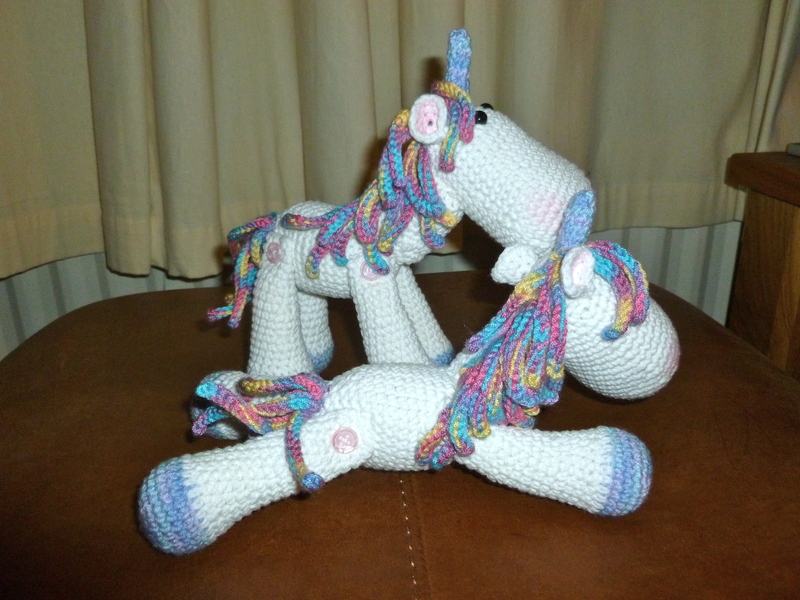 One of my sisters has a bit of a thing for unicorns so I decided at Christmas that I would make her one. 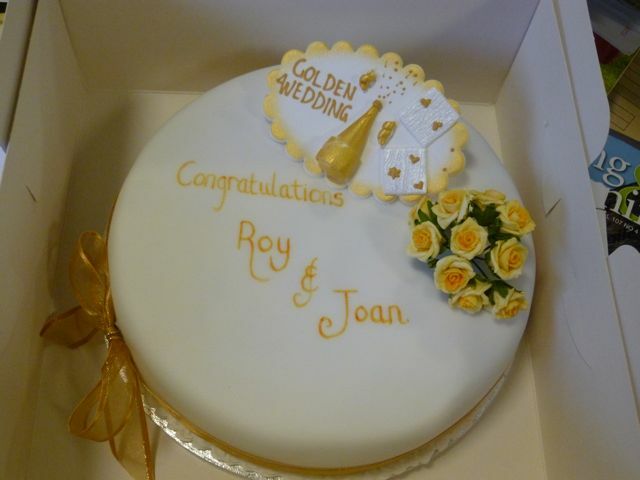 However, once made I could not bear to part with it so had to quickly produce another to give to her. I placed her unicorn in a prominent position complete with a label with her name on when she visited for my son’s birthday at the beginning of January. 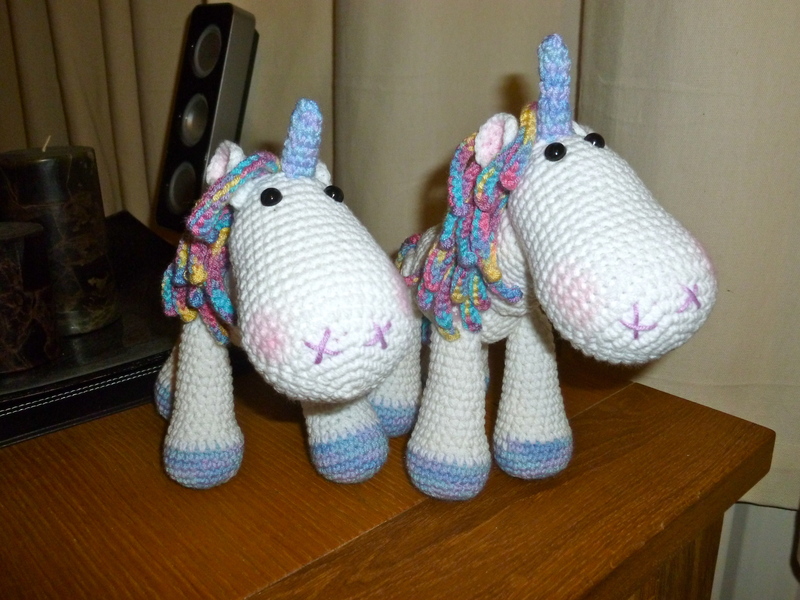 Again, once people saw the unicorn I was asked to make more. Am up to six so far with another one on the way. 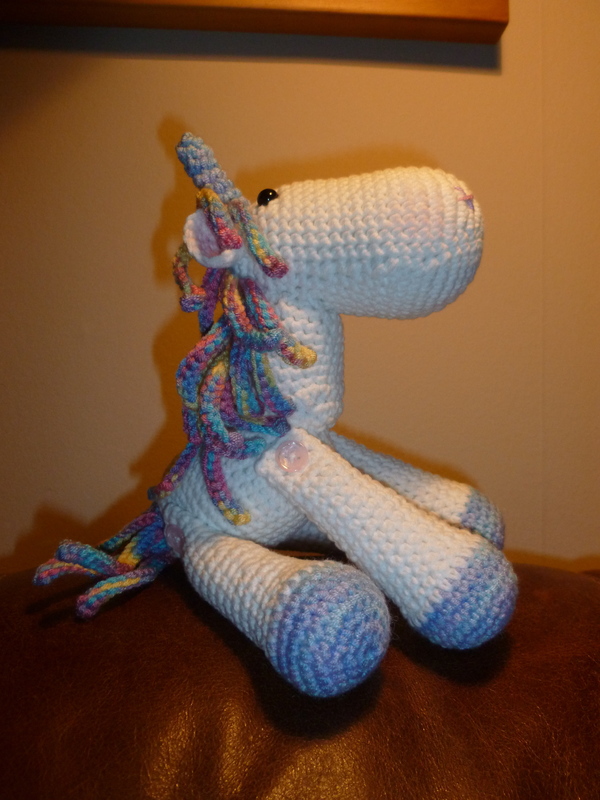 Another crochet pattern that I found online was one for a rainbow hippo. Some said it looked more like a horse or donkey but most agreed it didn’t really look like a hippo. My son decided to call him Kevin. 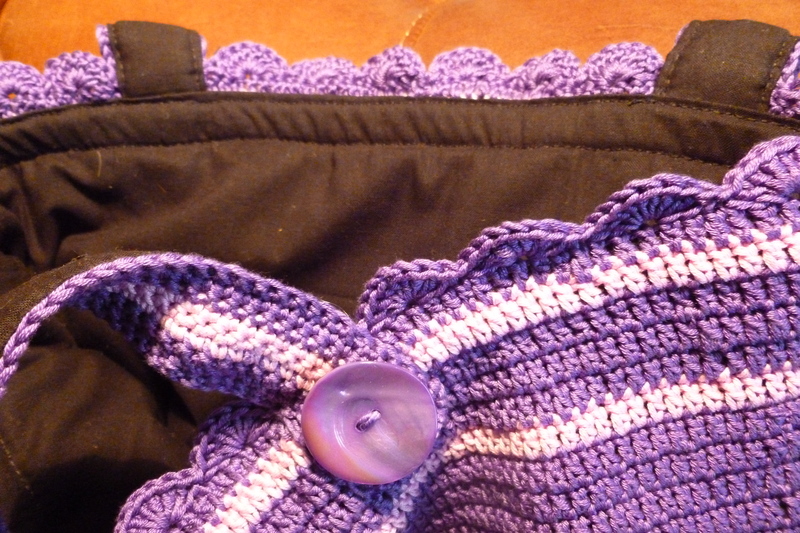 This was quite a challenge and I had to tweak the pattern quite a bit in order to get it to work for me. 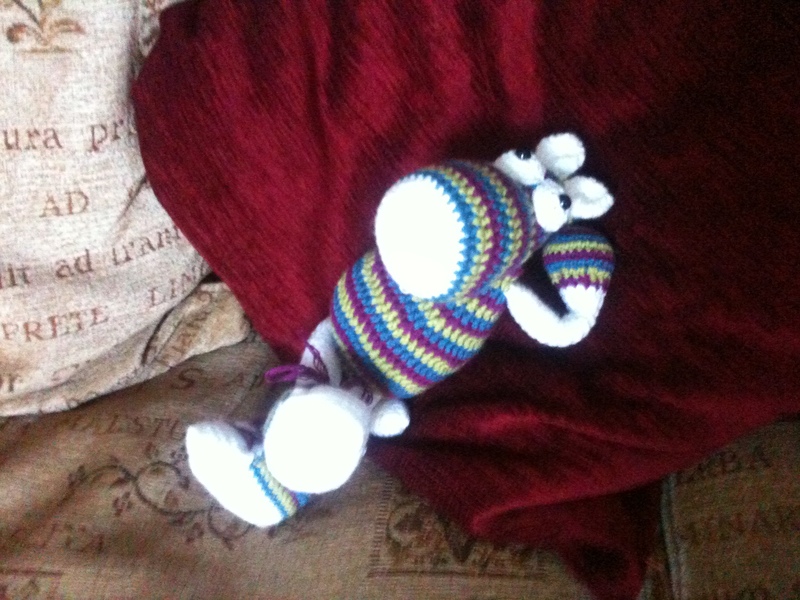 I also didn’t have the rainbow colours in the right kind of yarn so made him with what I had. He’s a bit of a dude isn’t he? I was thrilled with him and everyone who saw him instantly loved him. I very much didn’t want to part with him although I was eventually persuaded to leave him with my mum who was at the time recovering from a broken wrist. 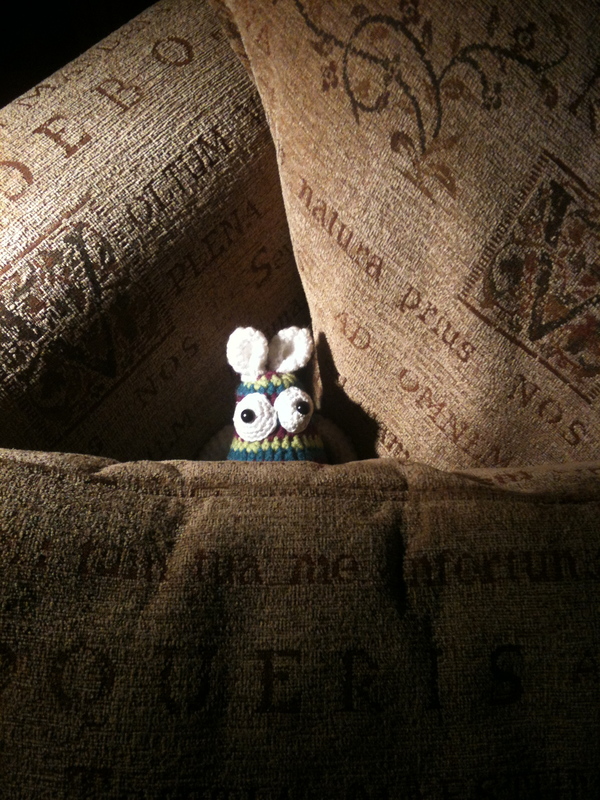 She insisted that it was he who hid behind the cushions in the night and nothing to do with her. Hmm. I wasn’t convinced, but I let him stay and he soon made himself at home. So now Kevin is very happy in his new home. Are you still here? Did you make it all the way to the end? 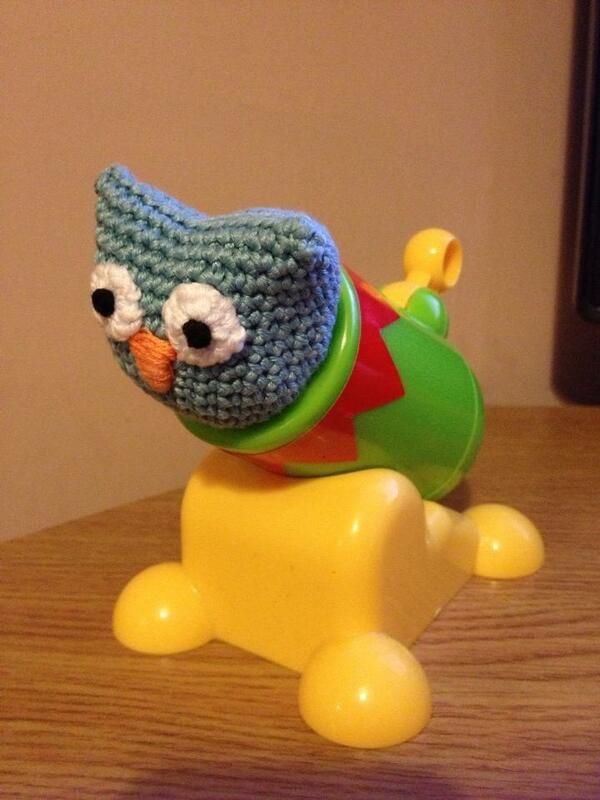 Well, it’s not quite the end of my crochet update. But I think I’ll save that for the next post. Each year at the end of July, my son W and I join my Dad and friends at the Cambridge Folk Festival. 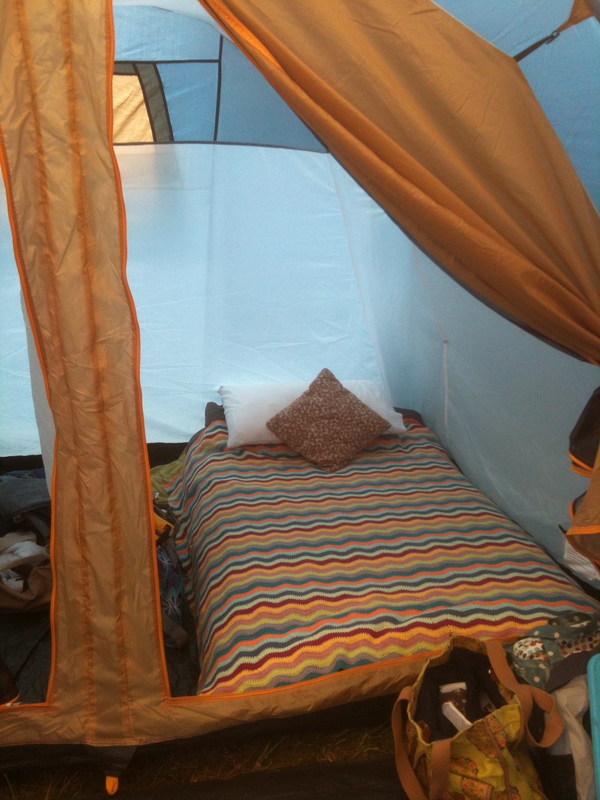 We like to camp in a little style and comfort – Glamping I think they call it these days -, you may recall my camping blanket that I made back in 2010. 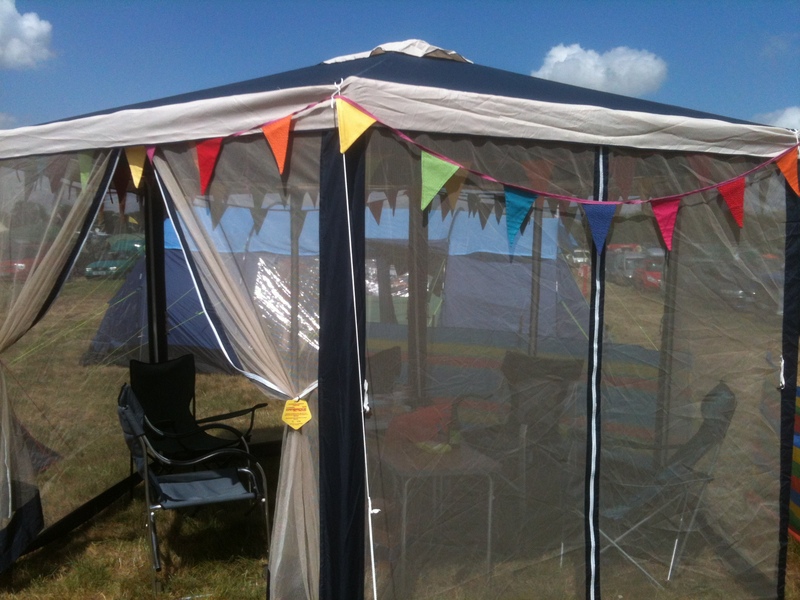 We have our generously sized tents plus a great hexagonal gazebo with mesh sides as our living / dining area. Each year we try to add some extra decorative touches to our pitch. 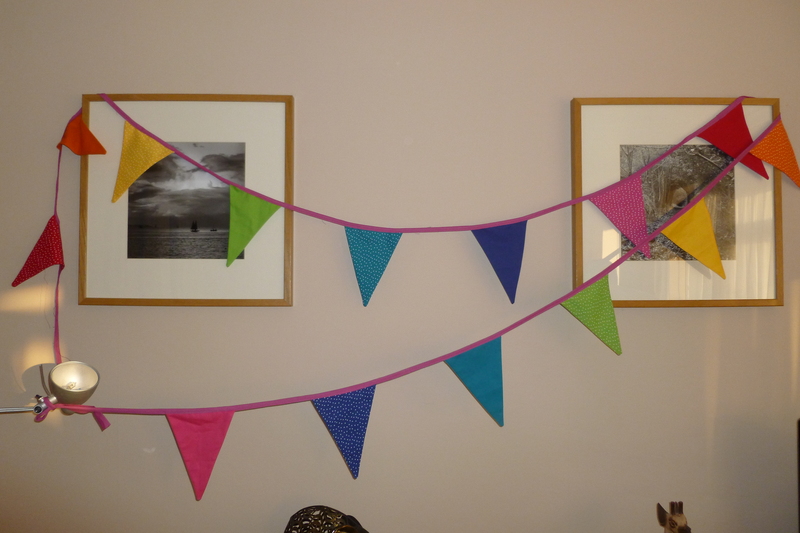 We already had some bunting, however, over the years it had become very frayed and tatty. I had been meaning to make some of my own for several years and last summer I finally got around to it. 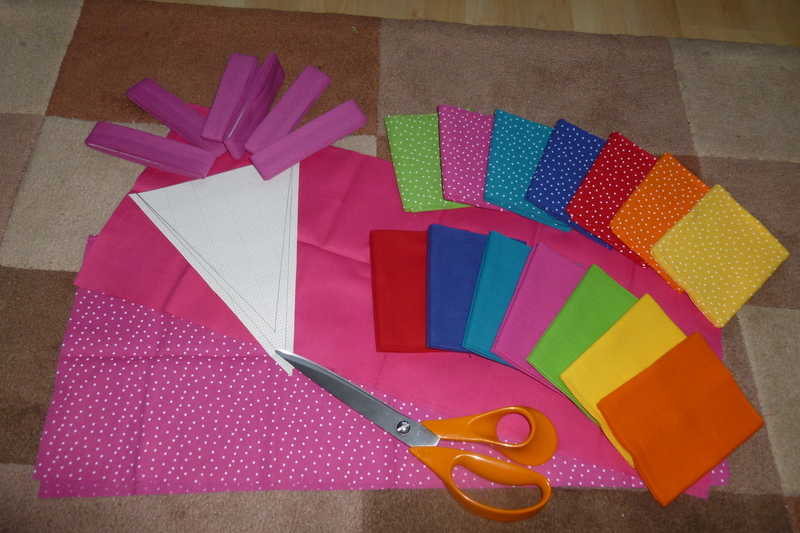 I came across some lovely bright fat quarters of fabric on special offer in my local Hobbycraft store along with some nice wide bias tape, then using graph paper I made up a simple template to use to cut out my pennants with. With careful positioning I was able to cut each fat quarter into ten pieces, enough to make five pennants and leaving very little in the way of waste material. 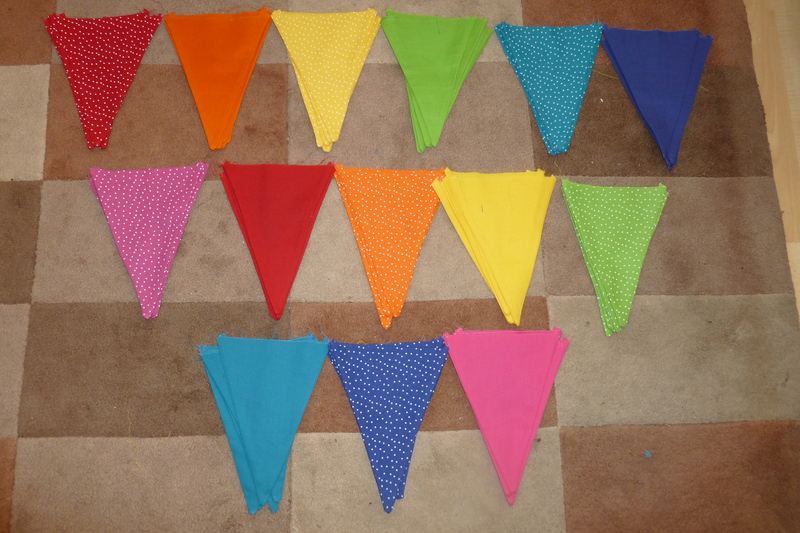 With fourteen fat quarters, after cutting out all my pennant pieces I soon had enough to make seventy flags. I set up a production line, first stitching the pieces together, next, trimming the seam allowance at the points and turning the pennants the right way out, with the help of a chopstick to make a neat point, then pressing each piece under a hot iron. For those who know me, Yes. I do have an iron and. Yes. I do know how to use it. It is a crafting tool after all. Once the pennants were all made I began stitching them to the bias tape. Unfortunately I ran out of tape before I ran out of pennants but we did still have 16 metres of bunting to adorn our pitch at last year’s festival. This year I purchased some more bias tape and stitched up the remaining pennants I had left. 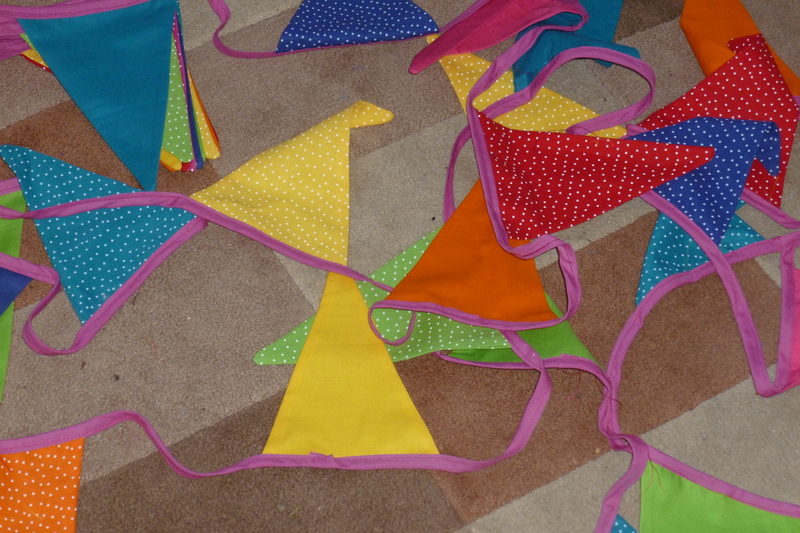 We now have an impressive 21 metres of bunting that we used to decorate our campsite this year. 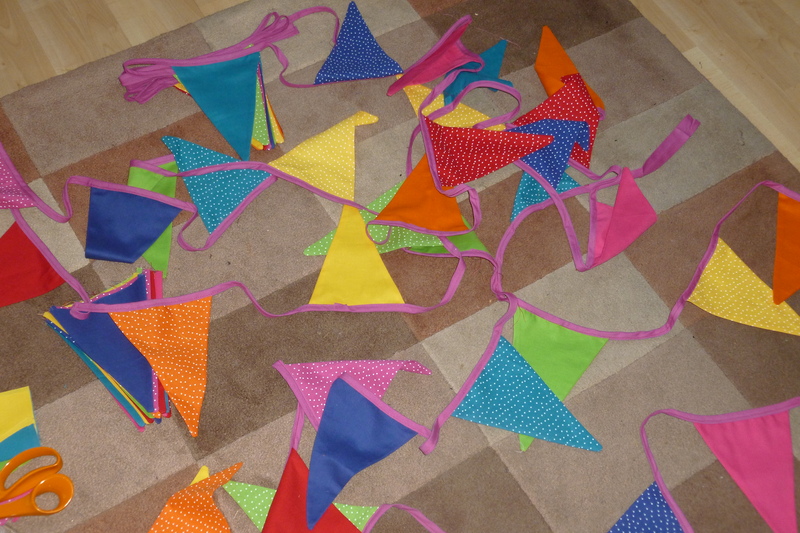 I’m not so sure that W was too keen on all that bunting when it was his job to fold it all neatly away to pack up safely until next year. 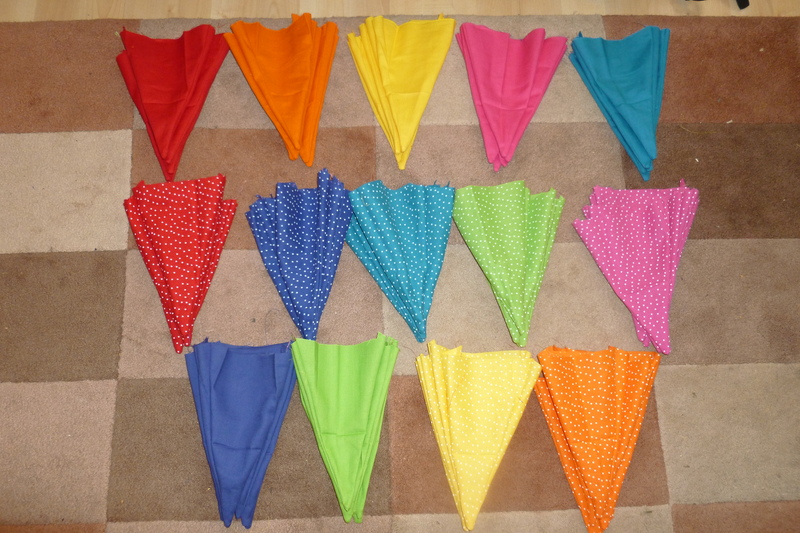 I have realised while typing up this post that I don’t have a picture that really shows just how much bunting there is. I shall have to get it out and takes some more pictures. I wonder if W will pack it away again for me? Oops. 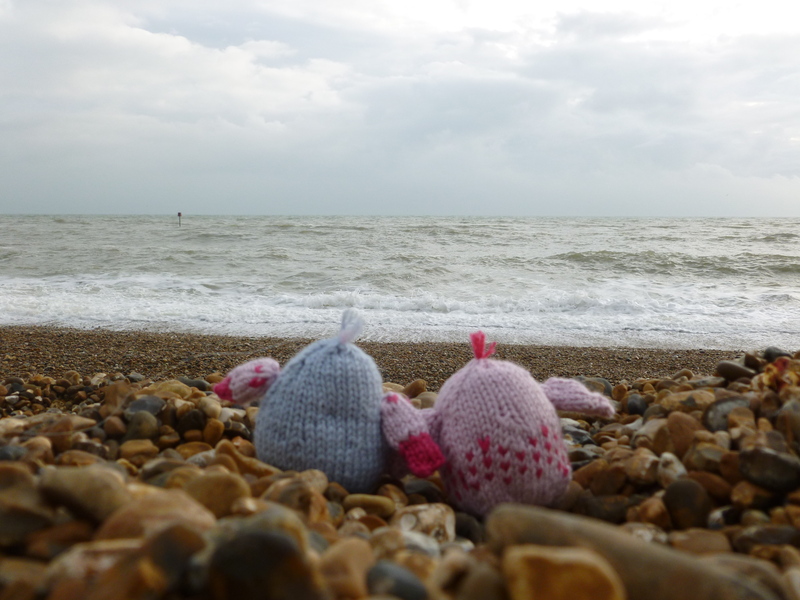 My blog catch ups hit a rather large hiatus again. Of course, that means that my catch up list is even longer than it was. In order that I might finally catch up with myself properly I shall endeavour to keep some of these catch up post short and sweet. 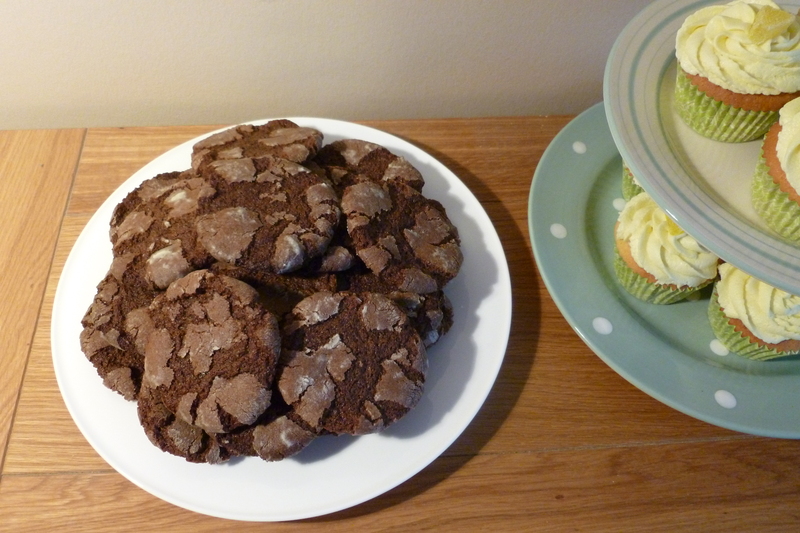 With that in mind I suppose a baking catch up is the most appropriate thing to share. It will be sweet if nothing else. Short? Well I’ll see what I can do. 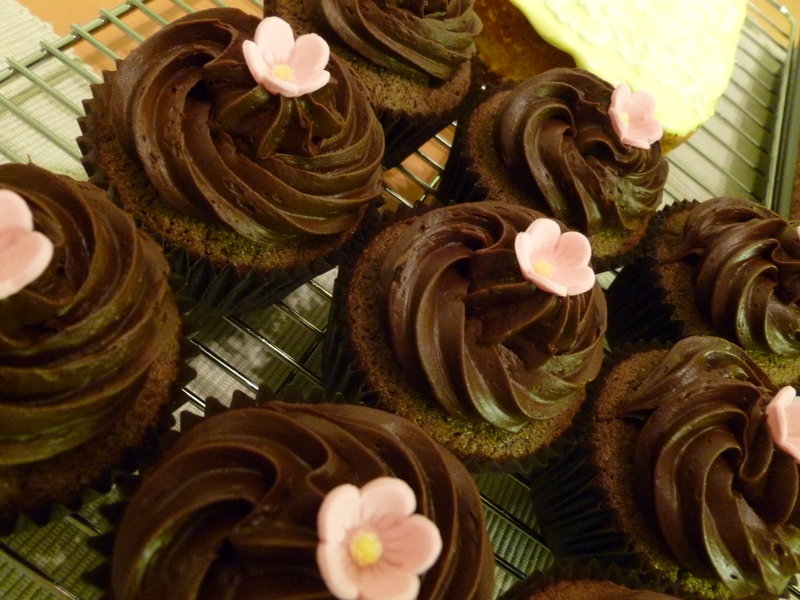 Fortunately for my blog and rather less fortunately for the usual recipients of my baking I haven’t baked as much in the last year so these catch up pics are mostly from the year before. 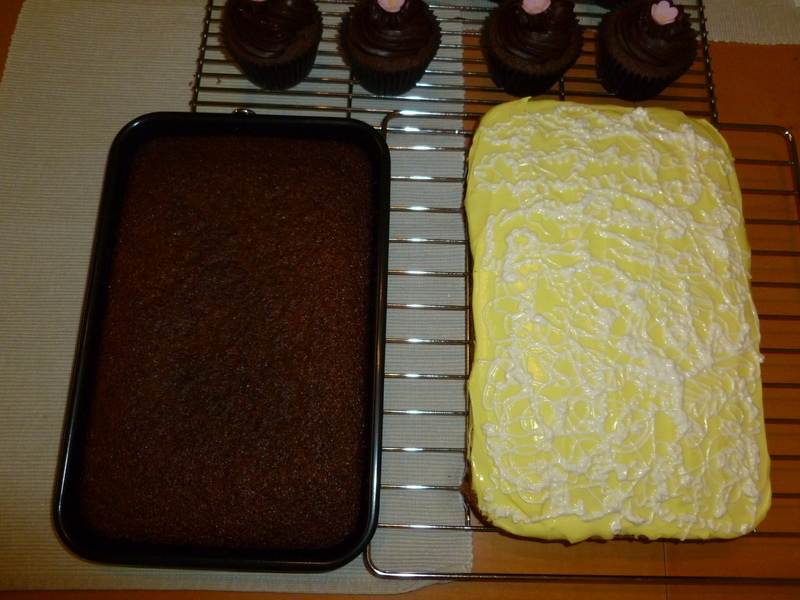 The first bake I will share is probably the one of which I am most proud. A good friend and colleague asked if I might be able to make a cake for his daughter’s 9th birthday (she has recently celebrated her 10th). 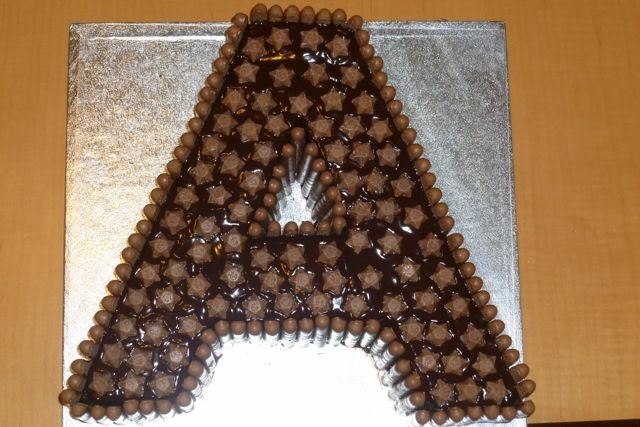 ‘Of course’ says I, ‘What would she like?’ Well what she wanted was her initial and it had to be chocolate, chocolate and more chocolate. ‘Leave it with me’ says I. I was pretty pleased with it and judging by the picture my friend posted on Facebook his daughter and friends loved it too. 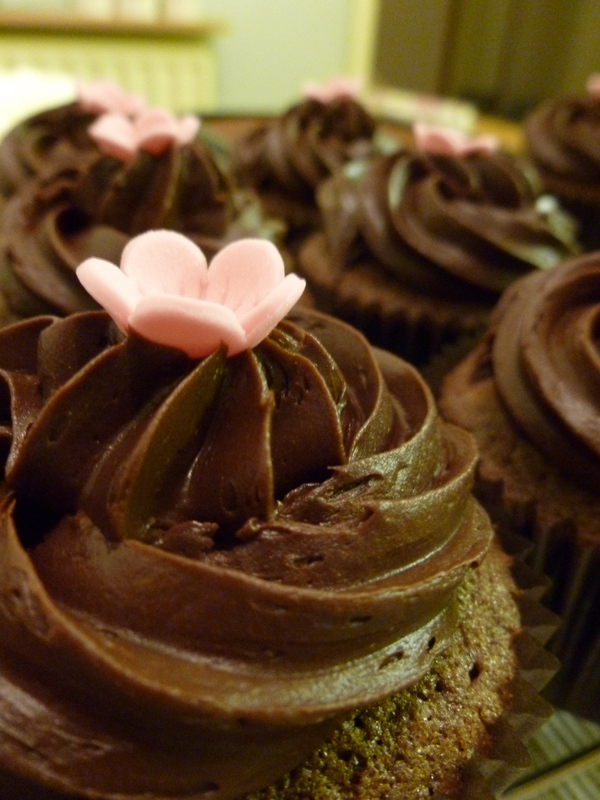 When I had completed the cake I had some leftover sponge and chocolate fudge frosting. 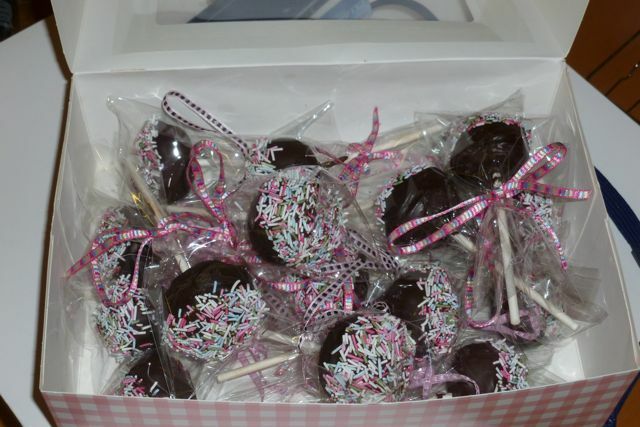 I had fancied having a go at making cake pops, so Amy had a little extra surprise. 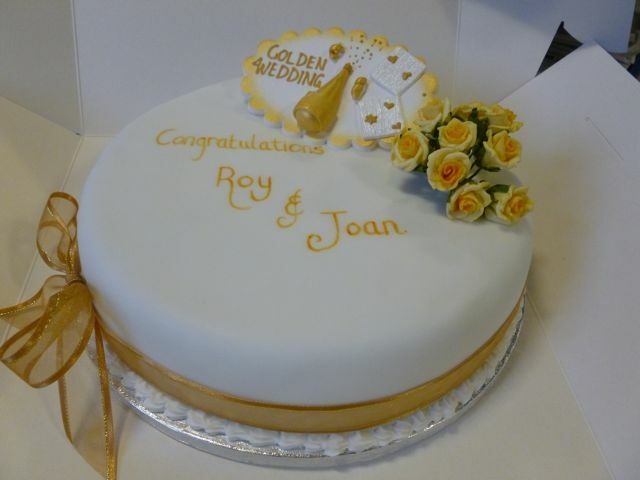 I had a second commission last year of a Golden Wedding Anniversary cake for a colleague in my office. I felt more pressure over this one. 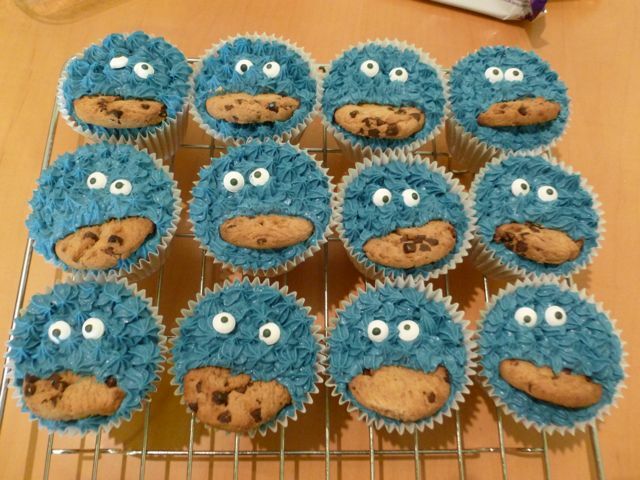 Another favourite bake was a batch of cookie monster cupcakes after I stumbled across a pack of candy eyes in Hobbycraft. 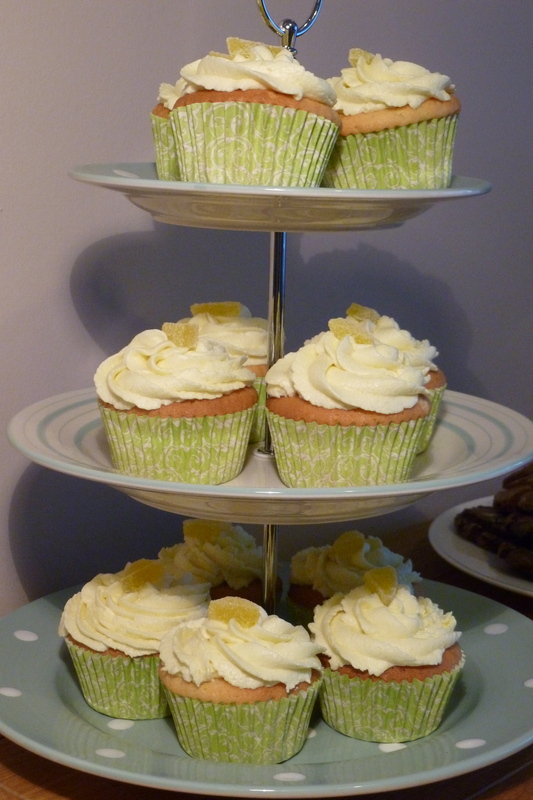 And there was a range of other bakes made from time to time. 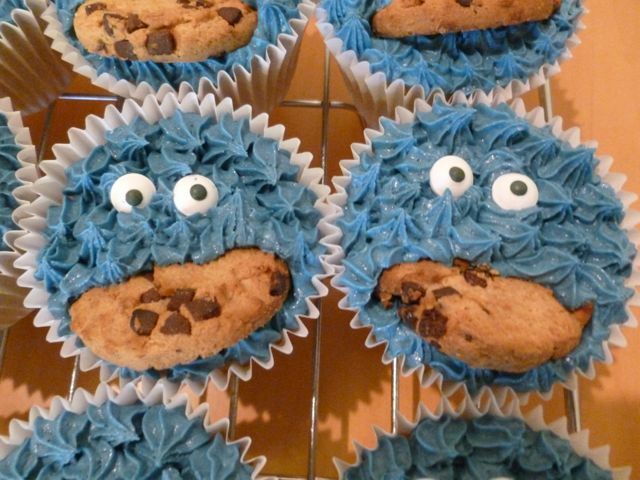 I think I need to do a bit more baking soon and get my mojo back again. I’m sure my friends and colleagues won’t complain. Another update coming soon. I’ll get up to date eventually. I am something of a heavy facebook user, however as I teach it is not appropriate for me to ‘friend’ my students on there. I have been thinking of setting up a ‘page’ for a while now and have finally taken the plunge and done it. 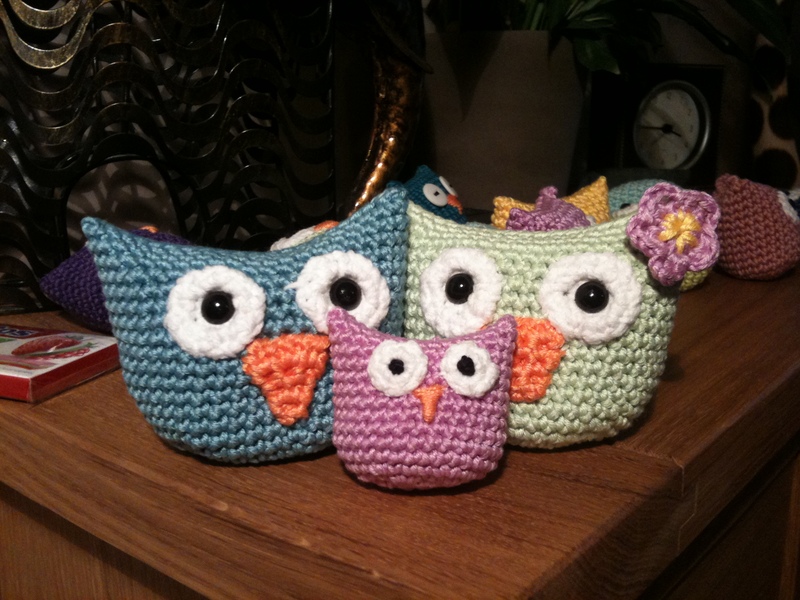 You can find my page at www.facebook.com/Bonitocraftscreations to see more real time glimpses of what I have been up to in my crafty and creative adventures. Come and have a look if you are a facebooker, like my page if you like what you see and I hope you enjoy looking at my crafty shares. I shall be back this week sometime with my next catch up post. Am getting there, slowly. No. Not me. This body is not built for such things. However, my son, now 15, at 14 and a half decided that he wanted to join a local Morris side. Not exactly the most mainstream hobby for a modern teenager to take up, but then my boy is not your typical modern teenager. Actually, to be honest, this story starts rather earlier. Back in August 2011 when William was 13, he was given a little single row melodeon by my Dad, that he had knocking around, with the now immortal words “See what you can do with that.” Well. What he could do was nothing short of genius, and not just in the biased eyes of a proud and doting mother. In minutes ‘the boy’ had picked out a recognisable tune. We were most impressed. William had been dabbling musically for some time, mainly playing flutes from India, China or Japan and since the previous January he had also been playing the tabla (Indian tuned drums) which he had picked up incredibly quickly and showed a real talent for. I did say he was not your typical teenager didn’t I? Anyway, I digress. Very soon the little melodeon was not enough and the boy started dreaming of a second row of buttons on his melodeon. 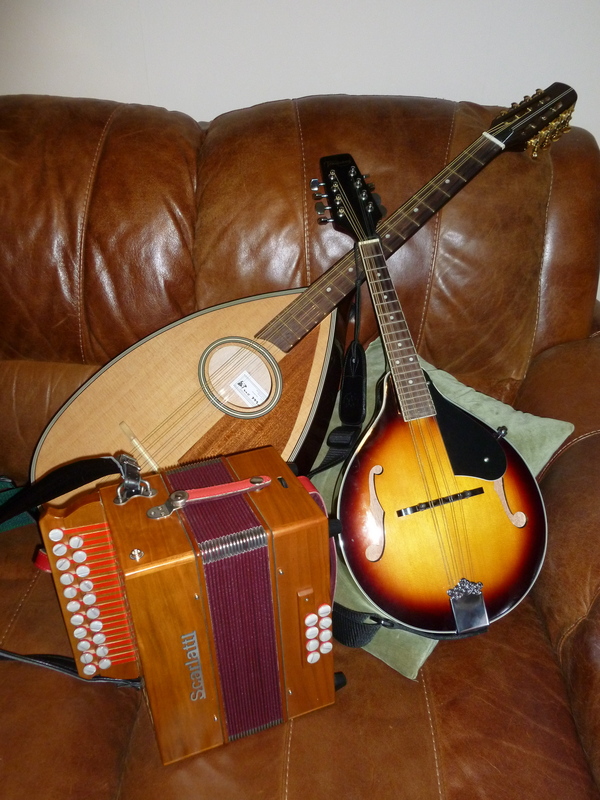 So, for Christmas 2011 family and friends clubbed together and bought him a lovely Scarlatti 2 row melodeon. He has been playing almost continually ever since to the amazement of everyone that sees him perform. During the first few months his musical skills went from strength to strength and he also taught himself to play the mandolin, bouzouki and the five string banjo. Playing alone is all well and good but William wanted the opportunity to play with other musicians. His main musical interest is in folk and traditional music styles and my boy decided that he would like to play for a Morris side. Now, if you are in the UK you probably now have an image in your head of men in cricket whites sporting bells and sticks and waving hankies in the air. Ah. Not so for this unconventional lad of mine. 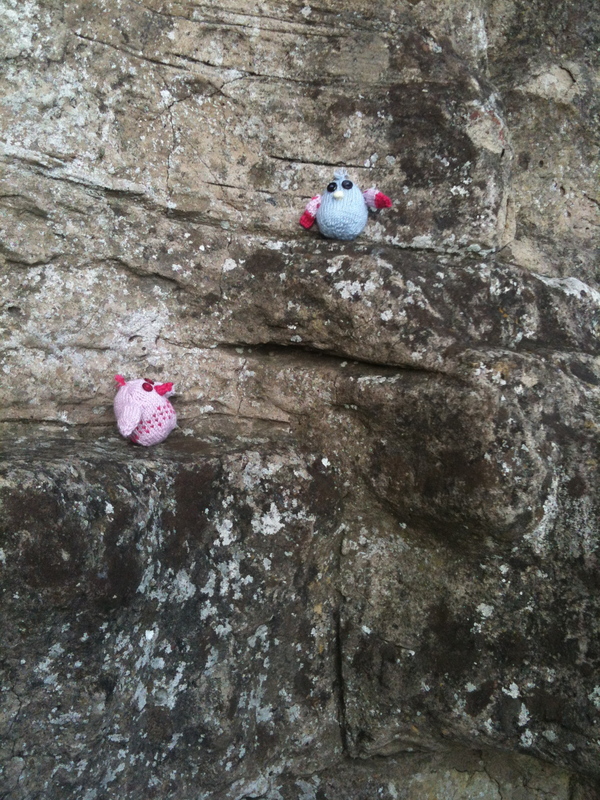 He wanted to join a local Border Morris side. I think of Border Morris as Morris dancing with attitude and in my humble opinion is way cooler than the Cotswold Morris that many people think of. 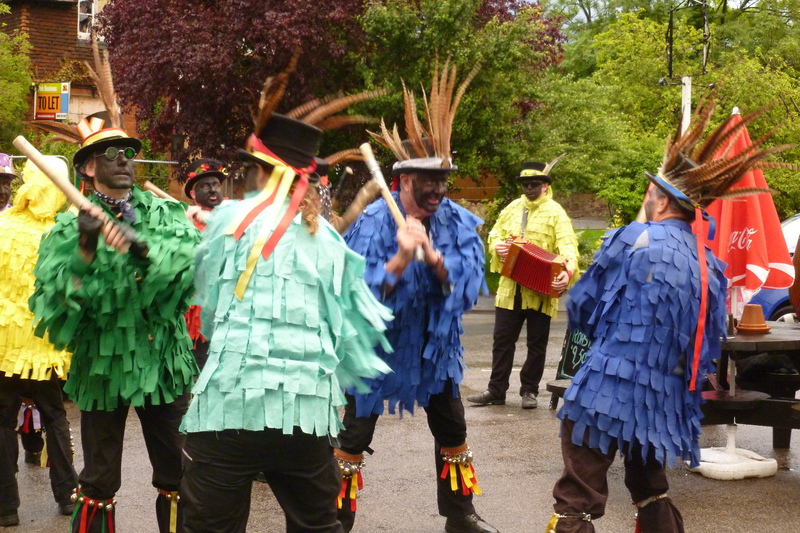 Look here for more on Border Morris and the side that William has joined. 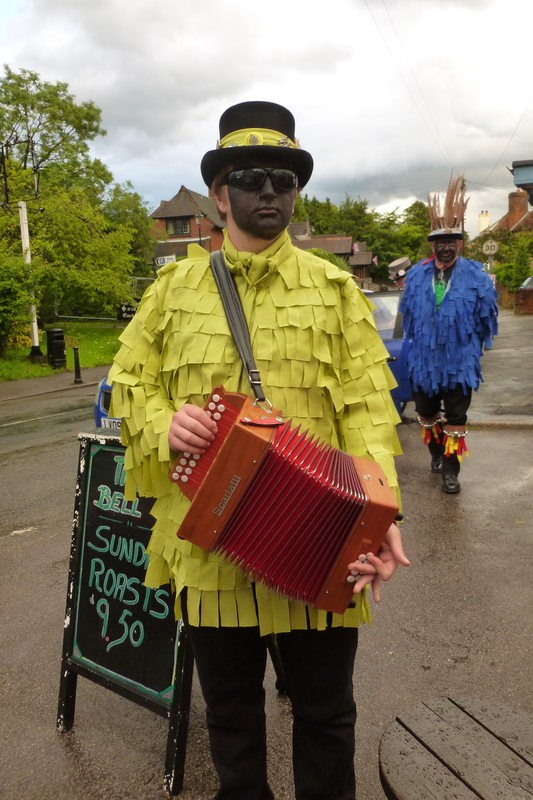 William approached Motley Morris in May at the Rochester Sweeps Festival asking if they had an opening for a new musician, The lovely group welcomed him with open arms and William starting joining them at their weekly dance outs throughout the summer. They loaned him a rag coat and we got him a top hat while Motley agreed what ‘colour’ he should be to maintain the ‘Motley’ ness of the side. Once they had settled on Lime Green it was time to get William his rag coat. Funnily enough, brightly coloured rag coats are not readily available in the shops. Indeed this kind of garment is even too niche for the wonderful world wide web. So, what to do? If you read my blog and I know that someone out there does, you will by now know that I always try to rise to a creative challenge when one is put before me. So, after seeking some advice from the lovely Lisa of Motley I set to work. 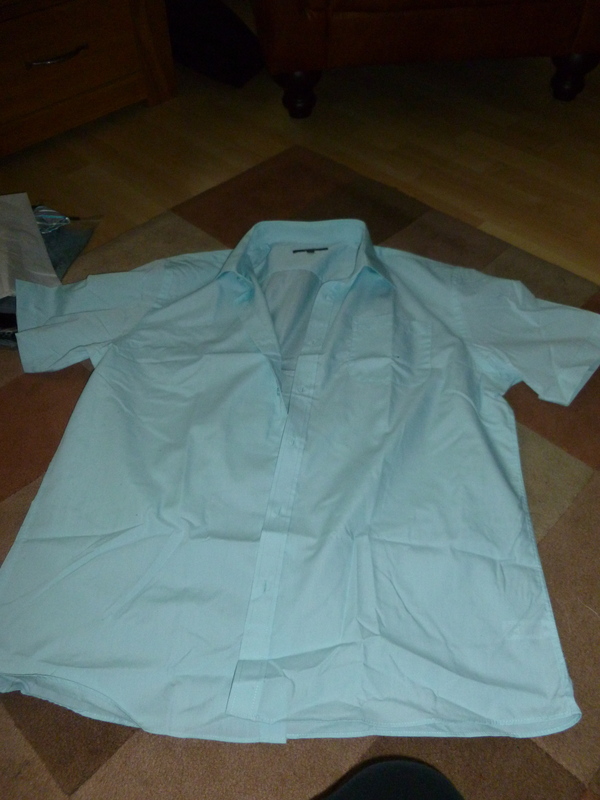 I purchased a large quantity (approx 10 metres) of polycotton sheeting and a large men’s shirt. Splitting open the side seams and sleeves I then cut wide strips of the fabric on the bias from the sheeting fabric. These strips were then machine stitched onto the shirt in overlapping rows until the shirt was covered. The collar was removed and covered as were shoulder panels to cover the raw ends of the sewn on strips. 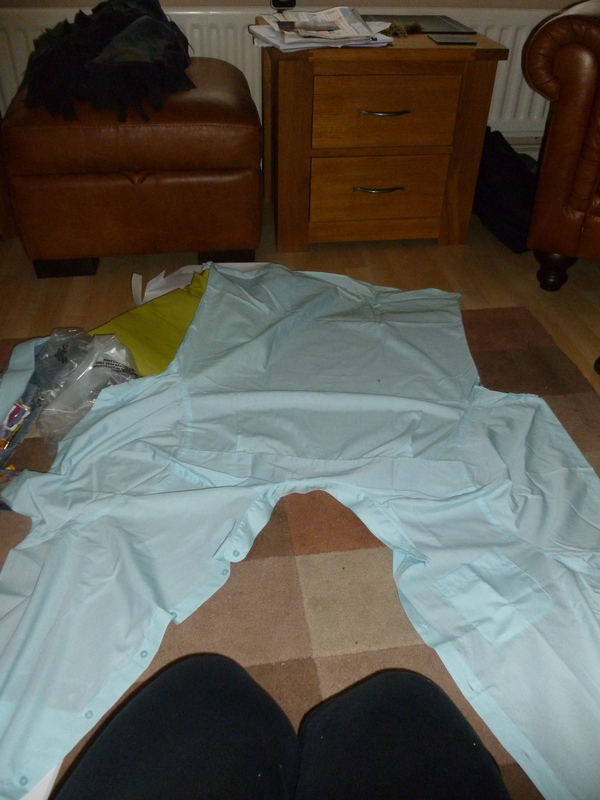 The side and sleeve seams were then re sewn. Once covered in panels these were then cut into rag strips to finish off the tatters. I added press stud closures to the front where strips were sewn to cover the raw edges at the shirt front. His outfit is completed with a top hat bedecked in badges and pheasant feathers and a long scarf to match his rag coat. Black trousers, heavy boots and a neckerchief complete the kit. (He is currently borrowing knee bells) Once his face is blacked in the traditional style of disguise (face paint rather than soot these days) he cuts quite and imposing figure. After the main summer season William started attending the weekly practice sessions and started learning to dance the dances leading up to his first dance out as dancer and musician on New Years day just days before his 15th birthday. I have posted some videos here, here and here if you want to have a look. I really enjoyed this creative challenge and am most pleased with the finished coat. However I will be more than happy if I never have to make another one ever again. My next challenge for him will be to make him his own set of knee bells. For this I shall need a couple of dog collars, large bells, plenty of ribbon to match his coat and leather to attach the bells to. AlthoughI am most proud of my creative achievements on this one. I am most proud of my talented son and his seemingly never ending abilities. 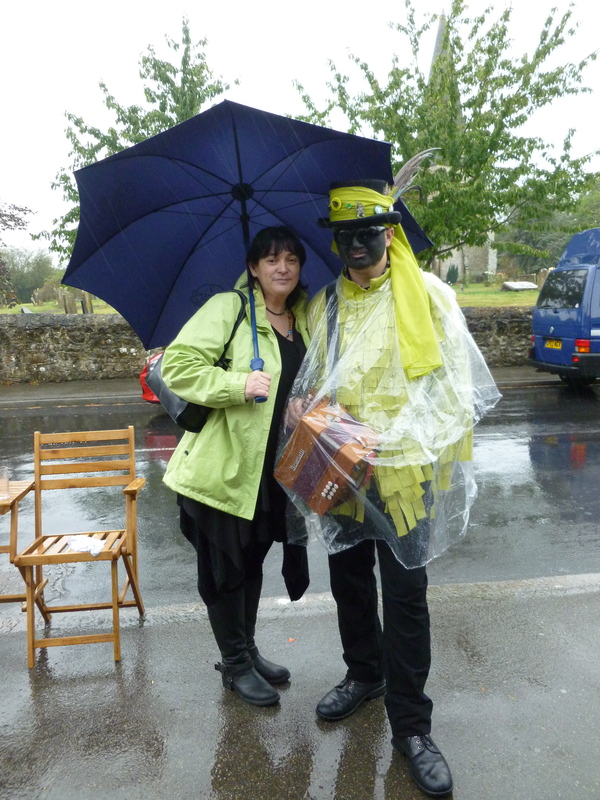 Here’s an extra video of him playing a lovely Italian tune on his melodeon. Look out for my next update for another folky make for our annual festival visit. Beautiful stitching cards by a very talented lady.